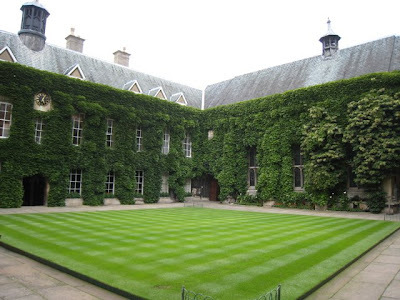 You can pay a few quid for a tour of lovely Magdalen College, but please be my virtual guest at high table. I promise a new perspective. 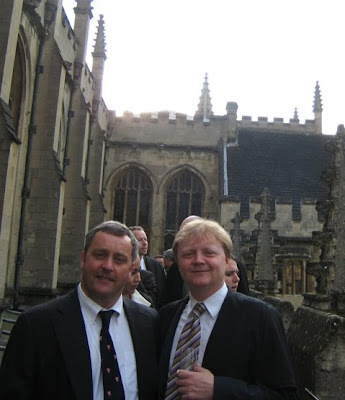 My old friend, Stewart Wood (at right with my husband, Henry) is both a Magdalen fellow and Prime Minister Gordon Brown’s advisor. His boss keeps him busy, but Stewart took a night off before President Bush’s visit to take us to dinner at high table. It was a special night, Magdalen College’s 550th. Happy Birthday!
. . . we had a champagne reception in the Senior Common Room. The oak-paneled chamber was out of another century and not a recent one with its deep-set windows overlooking the quads. The dark wood furniture was antique; the art was museum quality and the arm chairs were red leather before a fireplace. There were the dons in black academic gowns, their guests and the college president. 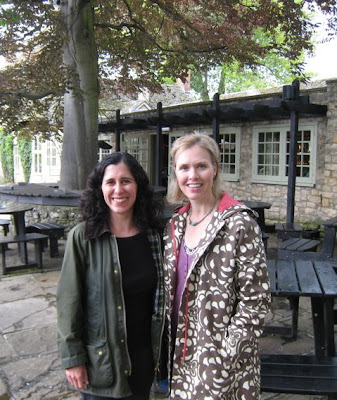 It was very social, and people were curious about what an American novelist was doing at Oxford. I was struggling to describe my genre of women’s fiction, when one fellow figured it out: “an Orange Prize book!” I wish. 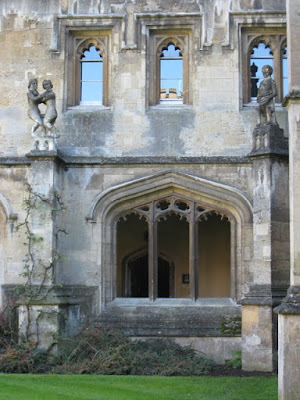 Magdalen has quite a literary history: Oscar Wilde and C.S. Lewis. When it was time to dine, we filed out a tiny door onto the roof. The roof? Yes! Philip Pullman did not invent his heroine’s rooftop rambling. Before Lyra, dons have been walking the Magdalen roofs every evening, and now I follow in their footsteps. I did promise you a new perspective! We entered the dining hall through another Hobbit sized door. The main entrance for the students, who ate earlier, was at the other end. That entrance is approached by a grand stairway. The high table is literally a long table placed at 90 degrees to the others on a raised platform below the oak-paneled end wall. Do the students wonder how the dons mysteriously apparate at high table? Before we dined, the Magdalen Boys Choir sang hymns from the balcony, and we stood for a Latin grace. Seating was open except for those at high table. By silver clad candlelight, we enjoyed a fine 4 course meal: soup, fish, meat and pudding. Then, as is English upper class custom, we changed seats for dessert wines, fruit and chocolates. You hold onto your napkins but nothing else. This time we were seated at high table, but first I admired the 550 year old royal charter displayed under glass. There were plenty at hand to translate the Latin. The delicate writing was perfectly preserved except for one smudge. Thankfully there was no vicious dog, but there was a phantom call box. I half expected to find Dr. Who. I was certainly a time traveler. It was good to walk and test my balance. After the champagne, white and red wines, I decided to pass on the sauterne and only took a thimble full of port, which is always passed to the left. The rooftop footing on the way back to the SCR was more treacherous in the dark. Someone must have refilled my glass during dinner without my noticing, or why else would I consent to be weighed after eating so much? 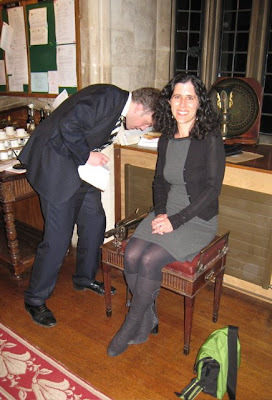 That leather bound stool is a scale, and my weight is now preserved for posterity in the Magdalen SCR record book. It was in stones so I have no clue. It’s hard enough to multiply by 14 when totally sober. Stewart and I became close friends in our early 20’s. I was finishing college, and he and Henry were starting graduate school at Harvard. Being around Stewart makes me revert. Instead of staggering home to bed, I accepted his invitation to visit the Magdalen student bar. Henry chimed in that it would be “research” for my novel. He was right. My protagonist is 20, she wouldn’t decline a pint (or a half pint in my case.) The bar was hopping with students celebrating the end of term and exams. It was all good fun until I woke up the next morning. Hmm, now I remember what being 20 really felt like. On top of that, I’d agreed to meet an Oxford student for a pint the next evening. If I’m looking a bit worse for wear in the photo, you know why. Marisa Benoit was great company and perked me up. 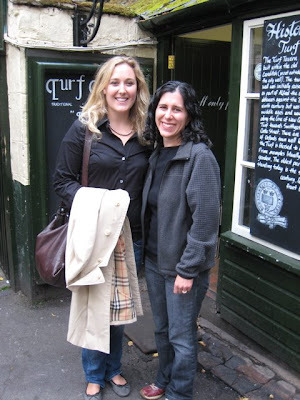 Marisa first came to Oxford on her junior year abroad, and now she’s come back for an MSC. She’s from a really small town in Maine. I was thrilled to meet her because she has given me insight into my character who comes from a similar background. Marisa gave me a tour around Lincoln College. 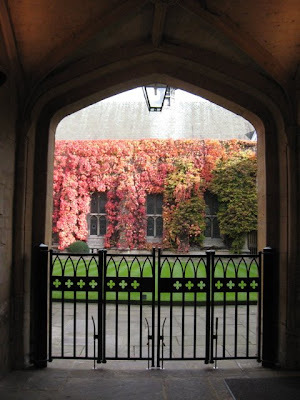 The time to see it is in the fall when all the ivy turns bright red. I peeked my head in back then but had longed to see more. Lincoln is a small college, but has a large graduate student population, making it a good choice for further degrees. It’s a warm, cozy place unless you're an imp. An imp? That’s a daemon they keep locked in a cell by the student bar. No, I hadn’t even started drinking when I heard this tale. That’s him in the photo. I’ll zoom in closer for a better look. Do you sort of wish that I hadn't? He makes gargoyles handsome. The Lincoln Imp used to grace a corner of the front quad, but now he’s been locked up for safe keeping, and a modern imp has taken his place. Are you thinking what I’m thinking? 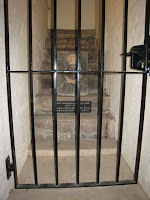 This imp could be the inspiration for Pullman’s daemons and the deathly tunnels below Oxford. It gave me the chills. The library at Lincoln gave me good chills. It was once a chapel (they have another) but is now devoted to worshiping books. Wouldn’t you want to study in this glorious space? Thanks, Marisa, for the tour and the pint. Another new friend this year is Bee. She writes a similar blog, Bee Drunken, about life as an American married to an Englishman here. We also share a love of reading. You have to check out her funny post on the 9 signs of going native (English.) For #10 I'd add putting the wash out on the line as soon as the sun shines. Bee and I met for a Port Meadow walk, but of course it was pouring. We had lunch at The Trout instead. When people ask what I enjoy about blogging, it’s the 2-way street. I’ve “met” so many interesting people though comments and blog links. It has made this year living abroad feel much less lonely. I love hearing your responses. I also appreciate writing and publishing in an instant click. A bunch of you have asked me about buying my novels. It will be a wait. 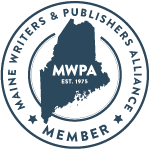 My agent is looking for a publisher for my first novel, Moose Crossing, now. S.A.D. is still in revision. I’ll be writing NOT CRICKET (A MATCH FOR EVE) when I return to the USA based on material collected in this blog. It takes a long time for a manuscript to become a published book. Read my post, Shaping a Novel, if you want to learn more about the process. I will announce the good news on my blog and add links when (if?) the books are available for purchase. It’s conceivable they will end up with different titles. In the meantime, I’ll definitely keep blogging when I go back to Maine, and I’ll revisit England from time to time. I still have a few more weeks left. So much to do! It is so nice to meet others and get their perspectives and views on life. That may just be the very best part of blogging. I am enjoying reading your blog very much. Thanks for the tour of the colleges and a visit to the high table. I sure am glad you had practical shoes on too! It took me quite a while to read this post as it offered so many interesting detours in addition to the main road. I was pleased to catch up on some of your previous posts -- on women's writing, Phillip Pullman, etc. You manage to make it seem more fitting that our long walk got rained out! Yes, that is the special gloss that good writing and photography can give to (the sometimes less picturesque) real life. I will miss knowing that we are sharing the same weather, but I look forward to your Maine adventures. Great pictures and great tour. What an amazing experience! I know you're from the most cosmopolitan city on earth and had one of the finest educations available, but didn't it feel a little intimadating, as an American, being at an event like that? For me it would be, but I would love it! That's so cool that you and Bee got together. The blogging world is so cool! Good luck on your novels. It must be difficult to wait on everything to work out, but it sounds like you are close! I am so happy that I have found your blog and have a chance to read of your adventures. 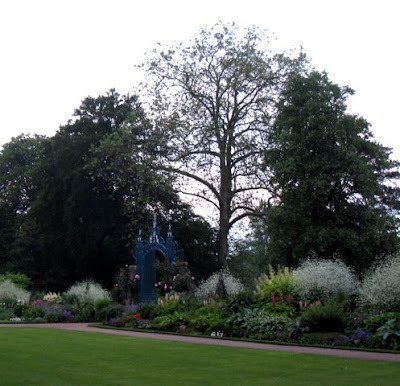 Thank you for visiting my gardening blog. You are so true when you say that blogging can make life less lonely, as I am finding out now that I am not working. Tina, I enjoy your blog too! Dress boots are the footwear of choice for the Oxford cobblestones. Bee, true, a virtual drink is not quite the same, but I bet you felt better reading this post than I felt writing it. It was a delight meeting you in person, despite the rain. I won’t miss the English weather, but I will miss not being able to meet you at the pub. 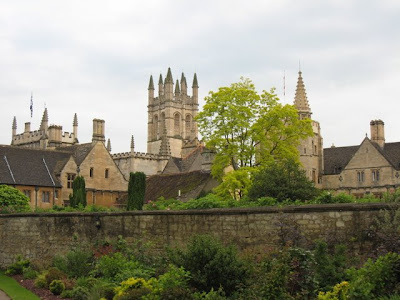 Alyson, I’m totally blown away by Oxford every day: the beauty, the architecture and the history. I do sometimes feel like the director will call me off set so they can start filming. Stewart was such a good host that I didn’t feel intimidated at all, just enthralled. This year has felt like a dream, and I’m not sure I want to wake up. Fay, you were with me in spirit that night. I think you would have fit in very well in your lovely pink dress. Welcome, Cindy! I wish blogs had been around when my kids were babies. It can be isolating staying home with little ones, but it’s so worth it. Find or form a baby group (look at your local library or pediatrician’s office.) That was a life saver for me. Those families are still good friends of mine. I’ve missed them this year. Kent, welcome! I enjoyed seeing the beautiful wildlife photos on your blog. I left a comment, I think. My Swedish is limited to one word. I did enjoy Katarina Mazetti's novel in translation and reviewed it last week. One day I'll have to visit Sweden, but blogs are the next best thing. 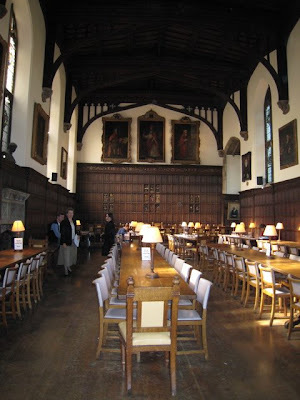 High Table at Nuffield College is not quite the same affair as at Magdalen--no walking any planks of wood. But it sounds like the alcohol consumption is about the same. Although I'll miss our walks and talks and lunches, I think our daughters will miss each other even more. How great to have met your family in Oxford. Hi Deb! I think that’s what makes Oxford so interesting – each college is unique. I’m not much of a drinker, but I’ve adapted to my environment. The English do drink more than Americans. I will miss our walks and lunches too! We’ll keep in touch through e-mail and blogs, but it’s not the same. This was such a good post to read. Your adventures at high table made for great reading. 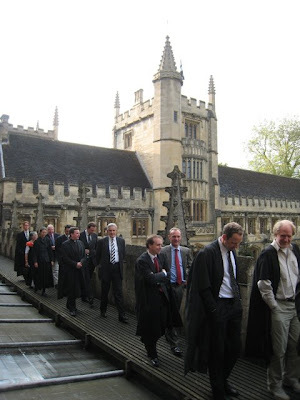 Oxford is so rich in ancient tradition that it is wonderful to see and to hear about it. I enjoyed how you met up for a pint or two as well. Our lives are much enriched by getting to know one another through our blogs. Different parts of the world come alive for us as we share the tales from our lives. I'm glad I have met up with you ... your blog is an interesting one. There's never a dull moment in your life - you pack so much into your time that it makes me feel like an overfed slug slowly wading through my garden day. Kate, you’ve introduced me to a cyberworld of garden bloggers, populated by the nicest people. 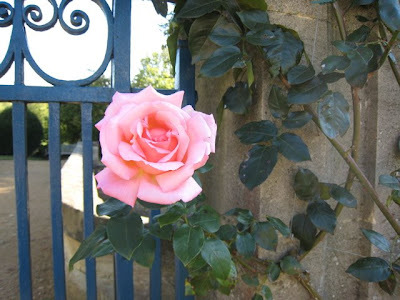 Yours is different than other garden blogs as you only use your blooms as a starting point to ponder creativity and life. Your blog, like mine, is hard to categorize, but life’s like that too. I’ve so enjoyed getting to know you. A sabbatical is not normal life, and I’ve been trying to fill mine, to the point of bursting, with new experiences. Even so, my life is much more sluggish than it appears. Most of my week is spent sitting in my tiny home office writing and rewriting my novels. It’s my weekly blog that reminds to get out the door and DO something. It makes for a better blog and a better book in the end, I hope. That red ivy reminds me of my alma mater in the fall. I used to love ivy. Then we moved to WA. It's the stuff of nightmares here. I've spent quite a bit of time in upstate NY, but am not too familiar with Maine. It will be great fun to follow your adventures as you return to the states. Curmudgeon, I too love ivy on other people’s buildings. As much as I’ve enjoyed Oxford, I’m looking forward to going back to Maine. The wild landscape is gorgeous; it’s such a contrast to cultivated England. I’m so glad to hear that you’ll follow me home. Very interesting and some great photos! A friend of mine once said that school is wasted on the young. Oh, I know that isn't true--my daughter loves school... 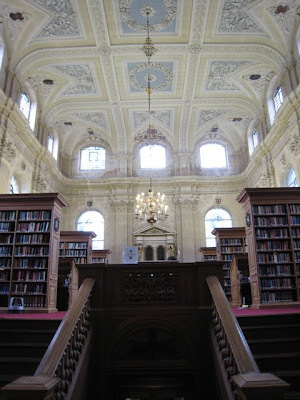 But seeing your photos of Oxford University almostmakes me wish for a "do over". I loved the photo of you and Bee in your rain gear! I have learned (yes, the hard way) to carry my brolly every day. JAPRA, my husband is definitely appreciating the amazing setting of Oxford more now than he did as a youth. Henry had a brilliant time back then too, but he took a lot for granted. For me it’s a dream come true to have this year in Oxford. Plus I don’t have to leave it behind. 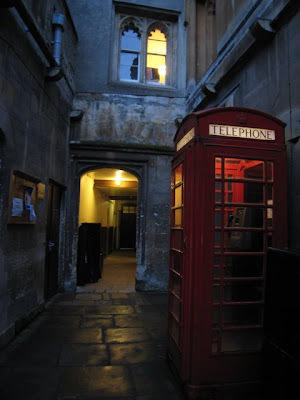 In my novel I can “become” an Oxford student or anyone anyplace. That’s a big part of the appeal of writing fiction and of reading it too! 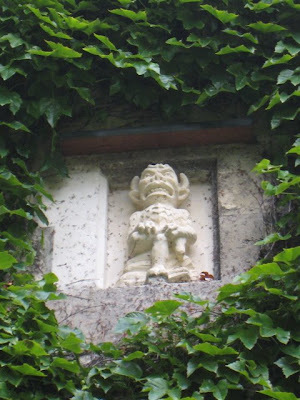 I have no idea what gargoyle that is, but it is definitely not the Lincoln Imp! Blackbird, welcome to my blog! 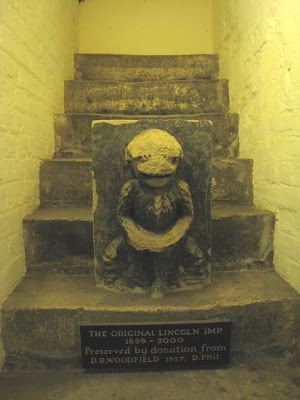 The plaque does say that this is the original Lincoln Imp – see photo above. 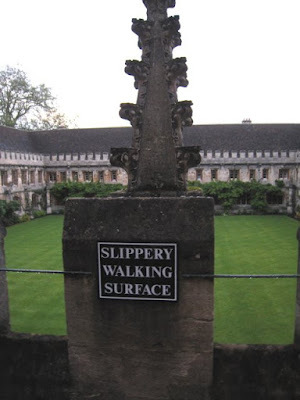 This one is in Lincoln College, Oxford University and yours is at Lincoln Cathedral. Places often share common names in England, creating confusion. Thanks for the link and for adding more imps to this post.